"What is the most resilient parasite? An idea. Resilient, highly contagious. Once an idea has taken hold of the brain it's almost impossible to eradicate..."
The Junkyard: This is the place where I'll post campaign ideas, notions, and high concepts that just haven't gotten built. Yet. Folks running D&D games love to talk about putting a touch of Lovecraft in their D&D games . I'm sure I'm not the only one who returns again and again to the idea of tweaking the tropes of D&D and running a Lovecraftian D&D game world. The popular Weird Fantasy Roleplaying game nudges D&D that way, toning down the clerical and arcane magic, and amping the grittiness. But just the other day I had one of those simplistic ideas that's just crazy enough to work - instead of trying to put some Lovecraft into my D&D game, how about putting some D&D into a Lovecraft game? Here's the basic idea: Chaosium created a Call of Cthulhu sandbox some years ago by publishing sourcebooks penned by Keith Herber for the major areas of Lovecraft Country - Arkham, Dunwich, Kingsport, Innsmouth, even Tales of the Miskatonic Valley. The towns are fully detailed, populated with NPCs; each book has a few mini-adventures, and provides the ability to play follow-up stories to some of the famous Lovecraft tales. It would not be hard to transplant these 3-4 sleepy little New England towns to someplace like the south of England, late in the Renaissance or during the age of sail, and run Lovecraft Country as a magic-light D&D game. 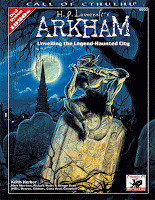 Arkham featured the famous Witch House (Dreams in the Witch House… has a familiar ring to it, eh? ), along with Keziah Mason and Brown Jenkin; there's a graveyard that's home to dozens of ghouls, the famous Miskatonic University restricted collection, and plenty of other Lovecraft stories are in Arkham. The University frequently finances expeditions to distant ruins, and could serve a similar role here. Dunwich has the sorcerous Whateleys, of course, but the Chaosium Dunwich adds a huge twist to the area in the form of sprawling underground caverns and a secret entrance to the lair of an elder god. 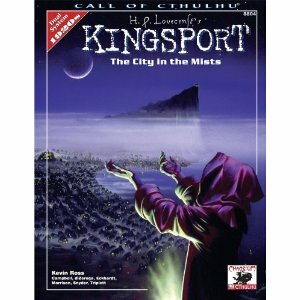 Kingsport is one of my favorite locales; there's the worm that walks, and an ancient cult of Tzulcha worshippers that travel to the lightless caverns beneath Central Hill (featured in the short Yule story, The Festival), and the The Strange High House in the Mist - a portal to the Dreamlands on the high cliff overlooking the town. Awesomeness! Innsmouth, with it's Deep One hybrids and Innsmouth look, seems cliché to me as gaming grist these days, but would still be fun to include. I might emphasize more the sunken Deep One city of Y'ha-nthlei and the threats past the reef, though the Esoteric Order of Dagon does make an excellent villainous cult. We could mix it up. Statistically, it'd be an easy campaign to pull together - mash-up LOTFP Weird Fantasy with Realms of Crawling Chaos by Goblinoid Games. There'd be no humanoids, limited or no demihumans, and low magic. The benefit of having a few hundred sketched out NPCs and living/breathing towns (re-skinned for the 16th century) and littering the countryside with Lovecraftian plot hooks - that's the draw. Presto, instant Lovecraftian sandbox. Heck, since it'd be in an alternate England, you could put in the Severn Valley and Campbell's Goatswood locations, too. I love Y'golonac and Glaaki. An obvious hook for the campaign would be the University and the College of Magic. (Perhaps magic is still studied as a black science, though the church works tirelessly to get it completely banned). One of the Arkham plot hooks in the Chaosium books involve some of the scientists at the University hearing about a recent meteorite and sending a group out to Dunwich to recover it; it very quickly plunges the characters into exploring both Arkham and Dunwich. This would work fine to kick off a Weird Fantasy version, and then let the players run with it from there. There's tension between arcane casters and clerics in the weird fantasy tradition (that whole witch hunt/heresy thing), but adding the Cthulhu Mythos creates a new dynamic. Arcane casters can argue there actually is blasphemous magic involving Elder gods and insane cults that threatens them all, and gives clerical party members a plausible reason for temporarily teaming up with them, despite the church hierarchy crusading to close Miskatonic completely. (I would make the standard magic user spell lists the 'acceptable magic' from the perspective of the majority of arcane casters, and the Mythos spells, from something like Realms of Crawling Chaos, as the banned magic found only in blasphemous Mythos tomes). I think the big mental switch for me is this - I would approach this like setting up a sprawling Call of Cthulhu sandbox, where you place monsters, cults, and adventures irrespective of challenge and levels, but run low-level D&D guys through it. It seems like a much different thought exercise than creating a D&D game, with the tropes of D&D in mind (classes and levels and magical rewards). For instance, the Black City, while it might turn out to be an excellent mega dungeon setting, is clearly being built with D&D style adventuring in mind - it envisions much more pulp action, even with some of the horror. It's an interesting set of ideas, for sure, and closer to what I instinctively want to do with D&D than the dungeoneering, tactical stuff at the heart of the system. The idea of Y'ha-nthlei as a more tangible antagonistic force, a kind of Forbidden City not totally hostile to humanity but, at the same time, thoroughly repellent in a very fundamental way, rather appeals. Characters visiting the City of the Deep Ones and returning seems like a fascinating prospect, particularly since there's the whole implicit risk of doing a deal with the Deep Ones. Both you guys make good points. While I love Lovecraftian stuff, i worry "weird" is growing a bit commonplace--but i do think there are ways it can be done to freshen it up a bit. Heh, the new sandbox I'm working on for my game up here in the Poconos is LotFP with Realms of Crawling Chaos, some old GW Warhammer Fantasy adventures (from the much creepier 1e), and many Call of Cthulhu books. I've had those Lovecraft Country sourcebooks forever, and never wanted to actually play a Call of Cthulhu sandbox - we've done one-shots, and I really like Trail of Cthulhu/gumshoe for one-shot scenarios. But adapting and refitting these iconic locations for D&D would be a hoot! "...One of the Arkham plot hooks in the Chaosium books involve some of the scientists at the University hearing about a recent meteorite and sending a group out to Dunwich to recover it..."
@Beedo - I know you kid, but I don't necessarily let myself off the hook there, either. I think I don't try to invoke "the weird" with some of my City posts, though I wouldn't characterize all of it by "weird" as any stretch--other than in the common (non literary) definition of the word. Here's an interesting thing about Weird Adventures - as you can tell from my other post, I'm still getting my head around what makes weird, "Weird". I love the concept of Weird Adventures - I'm a big fan of Mignola and Dark Horse Comics, The Goon, Lobster Johnson, and Screw-On Head, and could see myself running those kind of pulp, supernatural adventures there. But I had difficulty verbalizing what made it "weird" when I was getting caught up on contrasting the Normal against the Weird (seeing as most of the New World is a bit weird). You answered on the other post (What is the Weird) when you said, the contrast with the normal can be in the reader's mind. With that in mind, Weird Adventures contrasts with the real world 1900's! Black City Bestiary - Watchers! Ethiopia blocks Dungeons & Dragons - Blogs!